How DEEP is your Creative Space? There are many fleeting moments of fulfillment… an intimate connection with another human being, a beautifully played soccer game, a breathtaking view at the end of a hike. Creating something, however, is a kind of fulfillment that lasts many moments more. Sometimes it lasts just long enough to be eaten and other times it lasts well past future generations. Part 1 was about opening up a play space for your imagination. Part 2 is about the often neglected part of creativity… deepening your creative space. Strangely enough, the process of replacing my toilet has provided me with some startling insights. Before you recoil in horror at the thought of toilets, many a great ideas have been had on the seat of inspiration! There is more to this story though. If you indulge me, it is every bit relevant to deepening your creative space. When I first looked at my toilet, I was overcome by a sense of dread. It’s dirty. It’s heavy. And let’s face it, every first-time replacement takes longer than planned. How is it one button can cause the whole thing to flush? Why does the water in the bowl actually get sucked out (along with its contents)? How could a low-flush toilet work better than a high-flush toilet? Isn’t it incredible in this digital age (where most things require electricity or gas) that we have in our homes a device which operates time and time again without it? Except for when it doesn’t and then it’s even more of a mystery. It is a mystery and here’s the thing… I could stare at this toilet for the rest of my life and I will be no closer to figuring out how to replace it. I have to take off the cover! Similarly, it’s easy to admire a beautiful sculpture and wonder in amazement at its beauty. But underneath the wonder is a richer place of mysteries where the source of creation thrives. Underneath is a story of struggle and success, despair and discipline. Unless you’re ready to take the cover off, you will fail to find your creative spirit. When the cover is off, you get to see a simple machine in action. The handle opens up the flush valve to let the water flow into the bowl. After it has flushed, the tank refills itself ready for the next flush. Watch it one day. Really… try it if you haven’t already. Isn’t it strange and wondrous? Why does the valve open with one press, but close only after it has all flushed? How does it know how much water to put into the tank? What happens if the water keeps on filling? With a little curiosity and experimentation, you’ll have no difficulty in figuring out how it works. As a bonus, once you do know how it works, you’ll find that it is no trouble at all to understand how to fix a leaking tank or a broken handle. In a day where we want it fixed now and we want it given to us now, it is hard to take an hour or two to understand. Creativity can be like that too. Sometimes you know something is not quite right. A note is wrong, the taste is off, the idea doesn’t work… sometimes all it takes is the patience to stop and reflect and understand. I turned off the water, flushed the toilet to drain the tank, siphoned away the remaining water, detached the water hose, and unscrewed the washers that held the tank in place. With the tank removed, I was left with the bowl part of the toilet. Did you know that you can still flush the toilet without the tank? For the experienced home owners, you may already know that pouring a large bucket of water into the bowl will cause the toilet to flush. Haven’t tried it? Go ahead and try it for fun. I did…. Now for some of you, the question might be “why care?” Which is a legitimate question. You may have no reason to know. But let’s say that you wanted to build a better toilet, or let’s say that you wanted to know how rich and complex a creation is… then you’d have to know. The magic really is in the bowl. A cross-section reveals a simple arrangement that belies the complex physics involved. Somehow, this structure is capable of sucking out the contents of the bowl. How? Unlike the water tank, it isn’t obvious at first glance how it works. The key is understanding how a siphon works which dates back to 1500 BCE when the Egyptians used it to empty jars. When you put enough water into the bowl, the siphon will fill and literally pull the water out of the bowl. When air escapes into the siphon, it stops pulling water out of the bowl causing that gurgling sound. Put the tank and the bowl together and you get the basics of how a toilet works. 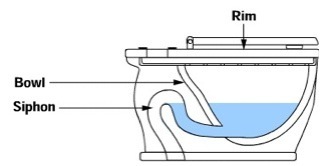 The tank of water essentially acts like the bucket of water which causes the bowl to flush. Remember grade school science? 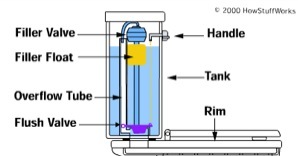 If you put a tube filled with water into a tank of water, the water will drain out the other end without any additional help as long as the one end is placed lower than the other end. To understand the physics behind the siphon, see http://en.wikipedia.org/wiki/Siphon. The average society plays to the myth that creativity spontaneously springs out of thin air… companies make sudden breakthroughs, scientists cry “Eureka!”, the public discovers the next celebrity artist. While luck and circumstances certainly play a big part, not enough credit goes to the effort that these people or organizations spent to develop their expertise. The Wright Brothers spent eight years in the workshop testing different wing configurations, building different motors, and practicing flight controls. When they finally revealed their invention, a few kids were watching and the news barely acknowledged it. I removed the bowl with a great heave and at last I was in view of the pipe (rough-in) that takes everything to the sewer. I replaced the wax ring with a new one. And now I prepared my new top-of-the-line low-flush toilet. My parent’s have a similar model and I remember watching amazed at how powerfully it flushed with only six litres of water (as opposed to my fifteen litres). If you had to design a toilet that flushes better with less water, how would you do it? 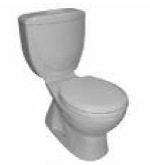 If you have been following how the toilet works, you can probably come up with some reasonably good ideas. Before you get too excited though, consider what resources you would need to implement it. 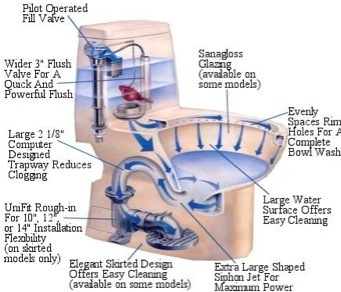 Below is a diagram of the improved toilet from the maker of a top-of-the-line low-flush toilet. Now imagine what it took to design this toilet. A better siphon – computer simulations were used to determine the most efficient shape. Imagine what the author of those simulations had to know to create the simulations. A better bowl – the glaze acts like a non-stick coating to keep the water flowing. A better tank – a wider valve allows the water to flow faster. If it isn’t clear already, the depth of your space is greatly enhanced by the technology available to you through other creatives. The modest toilet owes its lineage to the ancient Egyptians, the Romans and many people since then (see the box below). Creation then is not one person’s discovery, but one person that builds on the people before them. Believe it or not, it was only a hundred and fifty years ago that people emptied their chamber pots outside the window. The toilet (and the sewer system) makes city living possible. For a fascinating history see www.victoriancrapper.com/Toilethistory.html. As I was looking at the rough-in I imagined following that pipe down to the sewers which spiders out across the city and at some point returns to a sewage waste treatment plant. What an incredible system! I unpacked my new low-flush toilet, read the instructions, and decided to check the measurements. My toilet required a standard distance of 12” from the rough-in to the wall. I measured mine… it was a baffling 11”. I looked on in despair trying to will it to fit, but unless I wanted to move the rough-in or the wall, it wasn’t going to happen. Sadly, I had no choice but to put everything back. There are always setbacks when you decide to delve deep into your creative space. It takes practice and discipline to develop the skills, knowledge, and experience to create. Ten years is about the time it takes to become “expert”. While this seems daunting, it reveals the key behind creativity. Joy must be taken in the journey of going deeper and deeper. If it is important enough to you, then you’ll be ready to start now, play now, dig now, and nothing can stop you. I put the old toilet back, returned the new toilet, so I could order a new 10” toilet. Once I got over the disappointment, I realized with a little glee that I had plumbed the mysteries of the toilet and that has a reward all of its own.